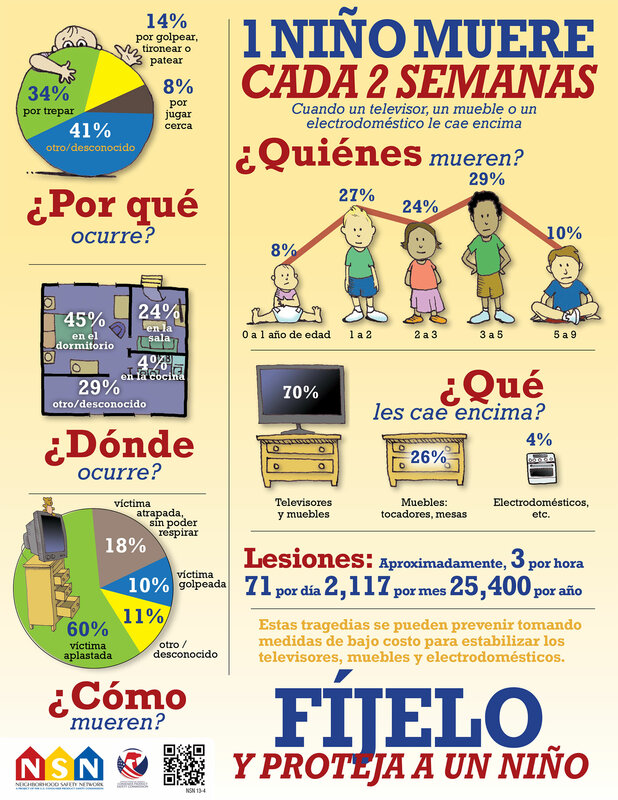 In December 2012, we posted an OnSafety blog, warning of furniture, television and appliance-related tip-over incidents. At that time, CPSC reported nearly 350 deaths, most involving young children. Since then, more than 80 people have died when a dresser, TV, bookcase, table, appliance or other large item tipped over and fell on them. A new report from our staff indicates that 430 tragic deaths occurred between 2000 and 2013, and an estimated 38,000 annual injuries, many of which were serious, from 2011 through 2013. In most of the incidents, a child was crushed by the product or struck on the head by the product. What is remarkable is the number of families who have turned tragedy into advocacy. Jackie Collas, a Philadelphia-area resident, is using social media to honor her son, Curren, and encourage parents to anchor their furniture. Lisa Seifert of Chicago created Shane’s Foundation to honor her precious son and to increase awareness, education and safety [www.shanesfoundation.org/SafetyInYourHome.html]. An Internet search of “anti-tip brackets” resulted in dozens of inexpensive options for consumers to anchor furniture, televisions and appliances. Prices for the devices range in price from $5 to $20. These devices are easy to install and unobtrusive. Most anti-tip brackets have some type of quick-release feature that allows homeowners to move furniture temporarily for cleaning or other maintenance. New furniture, TVs, and appliances often come with an anti-tip device. When making a purchase, ask your salesperson before you leave the store about how to anchor the item. When you get the new items home, install anchoring devices right away. When installing a new TV, CPSC recommends that you anchor not only the TV, but also the stand, bureau or dresser on which the TV sits. Secure the TV to the base product, and secure the base product to the wall. 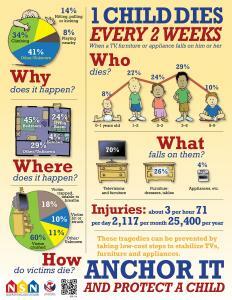 Now that your new TV is anchored, where are you going to put the old TV? 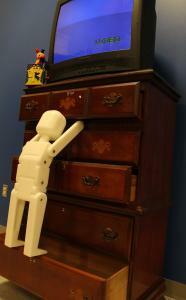 According to our new study, about 45 percent of tip-over fatalities involving a television occur in bedrooms. 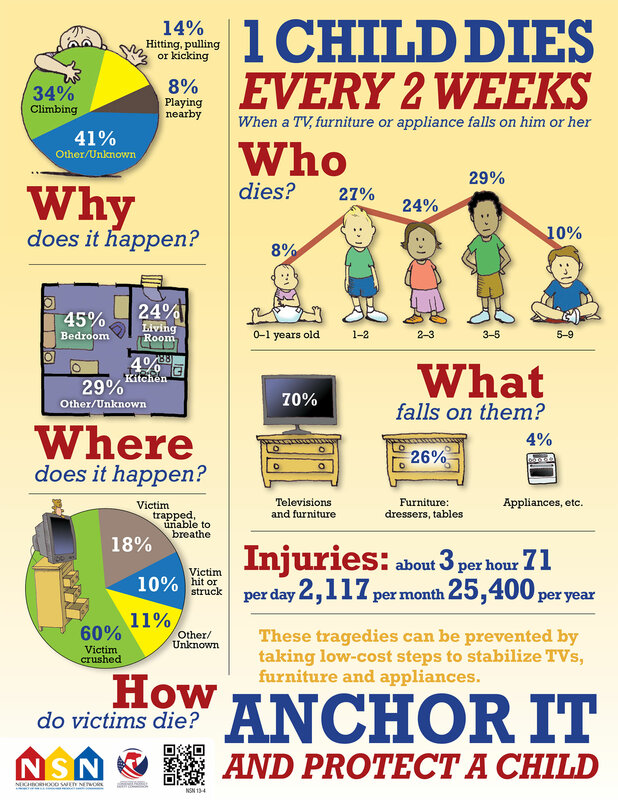 So, if you’re planning to move the old box television into your child’s bedroom or into the family room, consider that statistic—and then think, plan, and decide how to prevent a tip-over incident. Place the television on a base that is appropriate for the size, weight, and width of the television. Anchor the television to the base and anchor both items to the wall to avoid a tip-over incident. Children like to climb. In fact, about one-third of child fatalities involving a television occur when children climb onto the stand or dresser holding the TV. The children are often trying to reach a remote control, toy, juice box or some other item. Keep items like these, away from where children will try to climb and access them. If you have young children, the best idea may be to leave that old television on the floor. Do you have a rental agreement or home design that prevents wall anchoring? Anchor the television to a low, sturdy base, as far back on the base as possible. 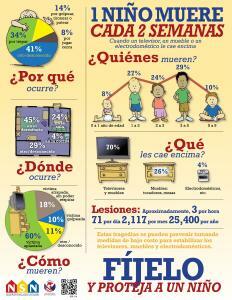 Every two weeks a child dies when a television, a piece of furniture or an appliance falls on him or her. Take simple, low-cost steps to secure furniture, TVs and appliances to save lives.